Last month’s meeting of the Cincinnati Lean Startup Circle was probably my favorite thus far. The turn out was larger than normal but the reason for my enthusiasm was the level of engagement of the entrepreneurs who showed up. There were many interesting ideas discussed openly which was refreshing. For me, a highlight of the meeting was the announcement of Ryan Walker’s newest venture, Engagement.io, a product intended “to help busy app owners or app developers get a system in place to not only track the engagement level of each of their users, but provide a tool to react to user activity and inactivity.” Better still, Ryan intends to blog weekly about his progress. If you’re interested in reading along simply visit http://engagement.io/. For the past year I’ve wanted to do the same with my pet project, BudgetSketch, but . Recently at Gaslight we’ve begun to formalize how we’re building internal projects. The team didn’t hesitate a moment when I asked permission to blog about the customer development process we’re following on our newest product, PaidSimply. So I’m happy to be matching Ryan’s commitment and intend to blog weekly about our progress with PaidSimply. Gaslight was founded as a consultancy specializing in custom application development. We frequently write software for internal use and occasionally this software exhibits signs of external value, AKA “a business opportunity.” We’ve been working to diversify our revenue streams and adding products to the mix meets that goal nicely. The challenge will be to grow the products branch of our company without negatively impacting our consulting business. Thus far, when there have been conflicts (mostly scheduling) we have erred on the side of favoring consulting over product development. To truly be lean we’ll have to discover a means of increasing our velocity or “rate of learning” if you will. The plan is to secure commitment to product development within Gaslight by presenting a clear path to sustainability. 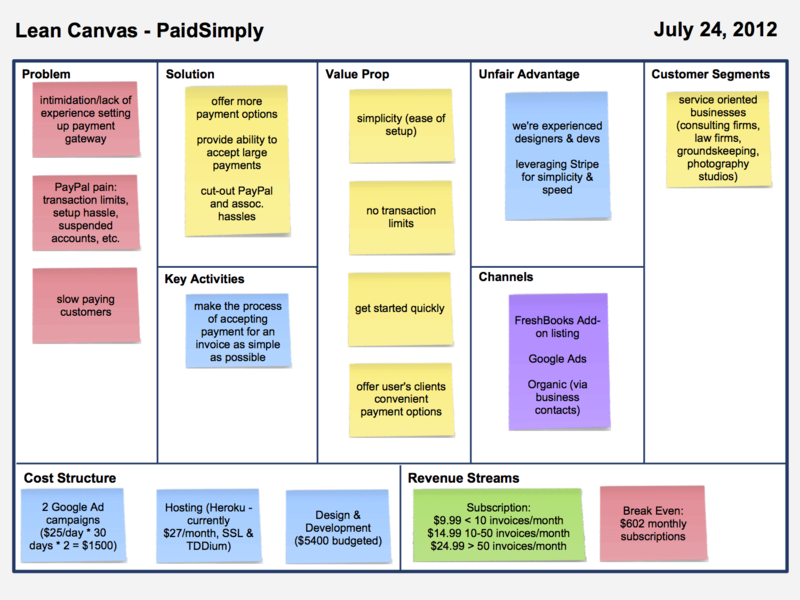 Ash Maurya’s Lean Canvas approach fits that need very nicely. We selected the Lean Canvas over Alex Osterwalder’s original Business Model Canvas because we felt that the former is well suited to early stage startups and the latter better suited to those in later stages. It will be a simple step to move from the Lean Canvas to the Business Model Canvas for those products that reach maturity. Like many consultancies we invoice clients frequently via Freshbooks but we and our clients were feeling some pain regarding collecting on those invoices. Chief among these was that clients wishing to pay via credit card were forced to do so via PayPal which currently caps single transactions at $10,000. With minimal effort we felt we could significantly reduce that pain with Stripe, a service that allows us to collect payment via credit and debit card without transaction limits. To test our solution we wrote a simple app that ties Freshbooks and Stripe together using their APIs such that once payment is received via Stripe the associated client invoice is marked as paid within Freshbooks. Not only did the test succeed in significantly reducing our pain but several clients who paid invoices using our solution mentioned their interest in using it for their invoicing needs. PaidSimply was born. Following the process detailed in Ash’s book, Running Lean we have documented our assumptions on PaidSimply’s Lean Canvas and present it below for your feedback in the comments below. We have thoughts as to the riskiest parts of the canvas but we’re eager to hear unbiased thoughts from our readership. So we won’t mention them at this point but by all means let us know what you think by commenting below. We felt we could easily sign up 10 beta users from our clients and their contacts but felt we’d benefit from having users from diverse business domains. The Cucumber stories will be used not only to develop the app but to demonstrate to the Gaslight team that the MVP is achievable and capable of generating revenue quickly (the best form of validation!). This should increase buy-in by the team and secure the thumbs up needed to proceed with the project, or this will be a very short series of blog posts! The plan is to have all the steps above completed by next weeks blog post. Stay tuned.